The rolling WSM for taking it on the road. 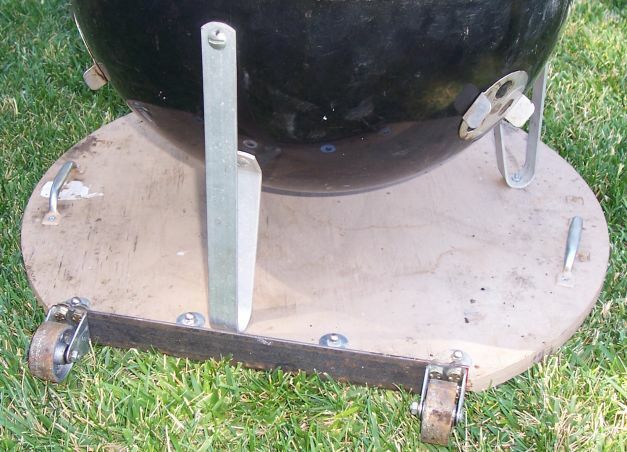 I knew I'd need to transport the WSM some distance from the car at Rics Backyard Warmup so I decided to do this portability mod. 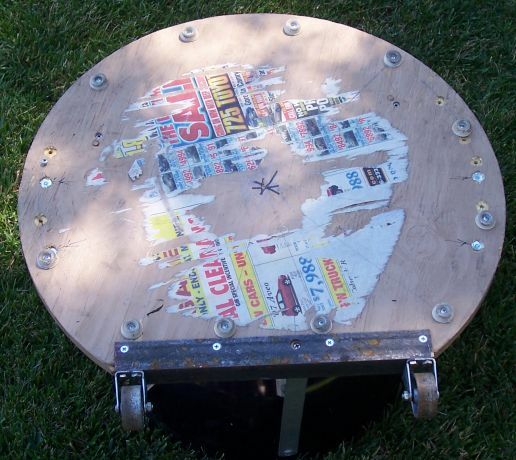 The wood disk is 24" diameter plywood, 3/4 inch thick. These can be purchased at hardware stores, I'm not sure about Home Dumpo though - everything is hit-or-miss there. This disk was already attached to the bowel as part of the Outdoor Caddy project. It was a simple matter next, of fabricating up the wheel assembly. A flat 14 inch was cut across the disk and piece of 1.5 inch mild steel L bracket was cut to fit. It would be thru bolted to the disk with the wheels attached. 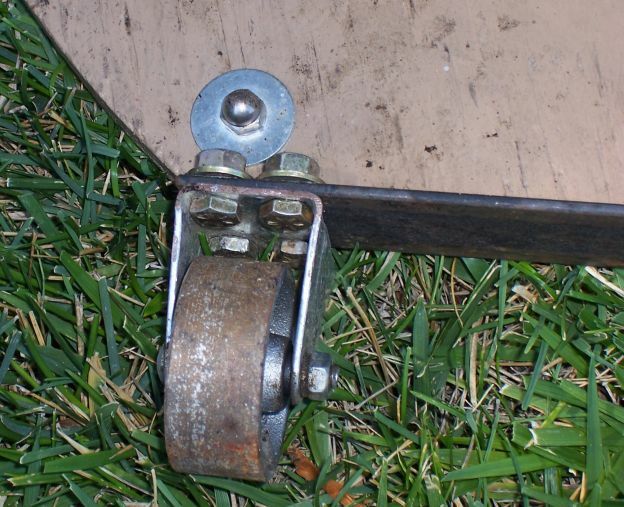 The casters are regular hardware store wheels. They had to be modified to fit onto the L bracket without overhang. To make it fit, the material with the mounting holes was removed. and new holes drilled. You can see two of the bolts - the top two are attached with regular hex nuts. But for the bottom two, I needed to tap threads in the L bar because there wouldn't be room for a nut. If you don't have thread tapping tools, then you can just remove enough wood to accommodate a nut. 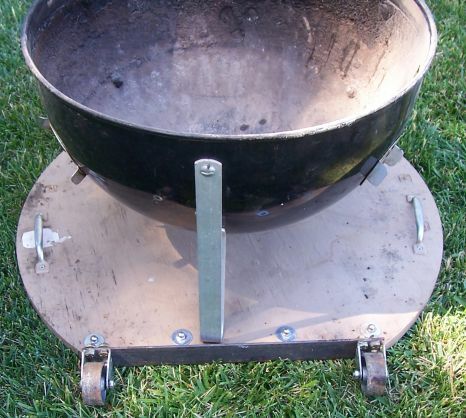 That's it for this part, the wheels are on, they barley do not tough the ground when the bowel is sitting flat - tip the entire Weber back, and it's up on its wheels, ready to roll. Ah,,, but I hear you say - what keeps the Weber from falling apart when you tip it back? Easy! The handles mounted to the disk serve a double purpose. They make it easy for me to pick up the bowel/disk for assembly and ash clean out. But they also act as strap mounts. I got a simple tow strap and latch at the hardware store. I had a local Dry Cleaner do some sewing, adding some velcro, and we have our solution. With the velcro, I loop the strap through the handle and velcro holds the loop closed. The other end goes through the lid handle and the latch holds everything down tightly. Grab the lid by the handle, tip it back, and away you go.